It's hard not to love Monster Products. From their earbuds to their headphones and Blasters, our team at PLuGHiTz Live could not be more impressed. Or so we thought. Introducing four wonderful additions to the Monster SuperStars: The S100, S200, S300 and S400. This new wireless series adds everything we love about Monster into a versatile set that provides amazing sound on their own, and superior sound when paired together. All four in the series include Pure Monster Sound, are fully water, weather, and splash-proof (Rated IPX7), and include a superior speakerphone with echo cancellation. 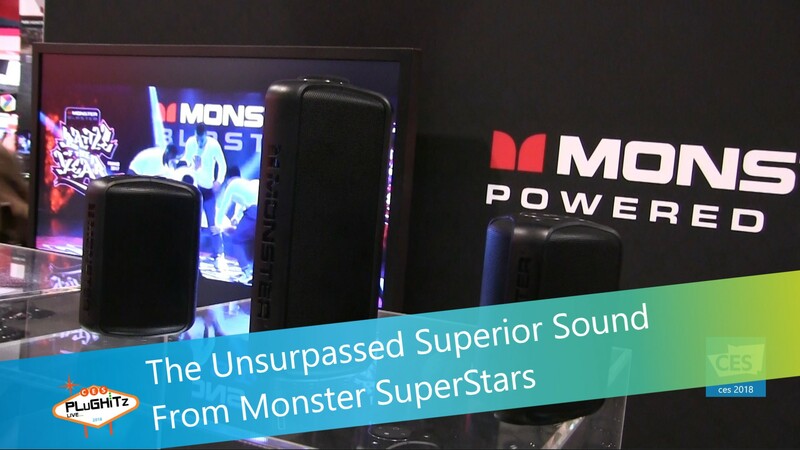 They also include Monster's own voice command system, MonsterTalk, which has the ability to access multiple music platforms, such as iTunes, Spotify and iHeartRadio. Starting with the S100, which is a sleek little stand alone speaker that delivers your music with a powerful punch that offers 6+ hours of continuous playtime. Next up is the S200, and don't let its size deceive you. It delivers incredible sound that is simply heroic with crazy deep bass at max volume levels without distortion. The S200 delivers 15+ hours of playtime in its three speaker configuration along with USB Direct for full digital audio performance, and has quick convenient pairing with NFC compatibility. Moving up to the S300 and S400's. Their larger size include features such as a 4 speaker configuration that delivers sensational Monster V-Sound™, a full-range driver (x2) and passive bass radiators (x2). They can also recharge your phone with the built-in power bank that offer enough juice to charge up to 2 devices simultaneously. And to make this series even better, the S200's and higher can wirelessly pair together as a two piece stereo set that is so bold, you will swear there's a third channel. With pricing that starts at $59, you can get more information and purchase a set of your own by visiting the Monster Products website.